#1 Rated Scottsdale Business Litigation Lawyers at Denton Peterson, P.C. In an ideal world, everyone would live up to their obligations and do what they should. In an ideal world, negotiation and mediation would help to reach a resolution when a dispute does arise. But we don’t live in an ideal world. Instead, we live in a world where costly court battles can be the norm when businesses and their partners or clients commonly disagree and fight. 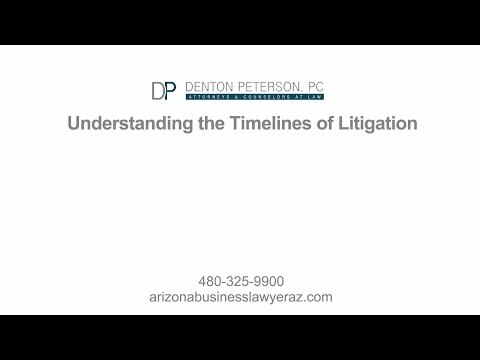 The Scottsdale attorneys at Denton Peterson PC represent corporations, limited liability companies and entities of all types and sizes in business litigation. Our experienced litigation lawyers spend an extensive amount of time learning all the details of your case to find the best legal strategies to meet your goals. We are fierce legal advocates who have more than 50 years of collective experience successfully litigating cases at the trial and appellate court levels. Our firm has a track record of success in these and other litigation cases, and our attorneys are ready to fight to protect your interests. Our lawyers also help guide you through the complicated process of litigation, helping you to understand the issues at stake and to make the best decisions that will increase the chances of success in your case. Many attorneys who have been practicing for years tend to take a cookie-cutter approach to litigation. They know what works, they think, so they apply those same methods to every case they get. Sometimes they’re successful, and sometimes they’re not. The Denton Peterson attorneys understand that no two cases are alike. We don’t use the same approach for each case because we know that each case requires its own unique strategy in order to accomplish the client’s goals. For more complex cases, we may need to carefully evaluate even the smallest of details. For other cases, we may be able to look at the broader issues to make the most compelling arguments. We determine the best strategy by taking the time it takes to review with our clients at the beginning of the case all the circumstances that led to the litigation and to understand what our clients hope to accomplish (whether they are defending themselves or bringing the litigation against someone). We tailor our approach not only to meet your goals but also to try to stick to your budget and the desired timeline. Our attorneys remain flexible so that we can modify our approach as needed as the case progresses. Part of our success comes in knowing when litigation is no longer the right course of action. When a trial would either become too costly or is looking like it would not be successful, our attorneys will explore other options with you, such as mediation and arbitration. When you work with a Scottsdale litigation lawyer from Denton Peterson, you won’t feel like just another number in a large pool of clients. You will get individual attention and will be able to communicate with your attorney often. At Denton Peterson, we make effective communication between attorneys and clients a priority. We understand how important it is for successful litigation, and we do everything we can to facilitate that communication, including encouraging open conversation and responding to emails and phone calls promptly. Our clients feel more comfortable about the progress of their cases because they know exactly where things stand. They are never left wondering what is happening with their case. Our Arizona business and corporate law attorneys are always prepared for all client meetings and court proceedings. They will have complete information for you so that all your questions and concerns will be answered. They will also talk with you about the potential risks so that you can make the right decisions for your case. You can feel confident when you work with a Scottsdale litigation lawyer from Denton Peterson. You can trust that you have an experienced and dedicated legal ally on your side who really cares about the outcome of your case. You can also feel like you are an active participant in your case and that you are not just handing over the future of your business to someone who is not fully invested in your success. Part of our success comes in knowing when litigation is no longer the right course of action. When trial would be too costly or be unsuccessful, our attorneys explore other options with you, such as mediation and arbitration. Call us today to start talking with a Scottsdale litigation attorney about your needs.